With Woogie Weekend just around the corner, we're bringing you the ultimate 'CAN'T MISS' list of acts and activities you'll regret if you pass up. Claptone- Perhaps our favorite artist on the line up, the mysterious masked casanova is sure to throw down a set that will be a highlight of the weekend. Spinning an eclectic mix of techno and variations of house, Claptone will have you bouncing and doing the two step from front to back. Ranging from uptempo beats to down and dirty baselines, Claptone will keep you on your toes and is a can not miss for Woogie Weekend. Damian Lazarus- Damian Lazarus has been a featured name on the house circuit for the better part of two decade in both Europe and North America. Boasting frequent appearances in legendary nightclubs like London’s Fabric and Ibiza’s Pacha, Damian Lazarus has earned his reputation through dark and minimal house sets all across the globe and is one of the best in the industry in his genre. Things can and will get weird during his set. Kidnap Kid- With the recent release of his Moments/Birds That Fly EP earlier this year, Kidnap Kid is riding high into Woogie Weekend on a cloud made of tight harmonies and heavenly vocal samples. His bouncy track progression and upbeat style will have the most seasoned Woogie Veterans and Do LaB newcomers getting down on the dance floor for hours. This is the set vibe to and you can catch us there! Jon Hopkins- Jon Hopkins is a multi award winning producer who is sure to shut down the festival with his hypnotic track list. Almost cinematic ike in progression, it is no wonder tracks by Jon Hopkins are so well respected. He is sure to bring the ambiance in his set which will put you in the mood for more Jon Hopkins. Mark Farina- Chicago native and SF transplant Mark Farina brings a fresh and funky vibe to the table. Blending down-tempo bass and house beats with acid jazz elements, Farina brings something completely unique to the Woogie Weekend lineup and is a wildcard for one of the best sets of the festival. Water Features- Woogie Weekend promises a variation of water features to cool you down when your dancing legs get too hot. In their inaugural instalment, Woogie Weekend went full backyard BBQ and busted out some grade A slip and slide action and is sure to follow similar fashion in its sophomore year. Prepare to bring out your inner child in a weekend which is sure to be full of nostalgic, wet and wild fun. 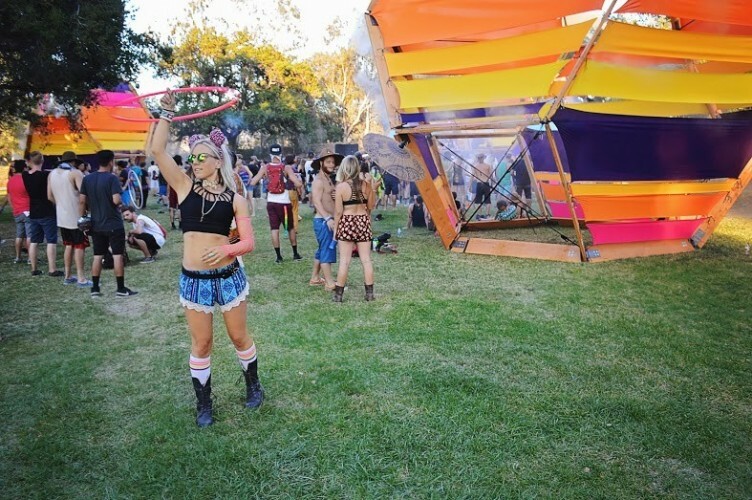 The Food- Woogie Weekend is full of options for foodies of all diet types. Last year Woogie Weekend provided a plethora of tasty treasures ranging from carnivore to vegan and everything in between. Be sure to hit up a few of the friendly vendors for a cool refreshment and wholesome meal to stuff your face. Sunrise Yoga- Be you a professional yogi or someone who can't touch your toes, there are yoga options for all skill levels at the break of dawn at Woogie Weekend. This is a perfect way to prep your body for a day of footwork or a rejuvenating way to recover from a bit too much fun the night before. Whatever your reason, definitely try to set your alarm for one of these amazing sessions. Camping Vibes- Perhaps the best part of Woogie Weekend isn't the food, or your favorite artist, but it is the amazing people you unite and bond with over the course of this transcendent experience. People of all walks of life come together to celebrate life and dance through this amazing festival, last year we met incredible and unique people, we became friends and connected on levels that would not have been possible without the power of Woogie, and we can't wait to do it all again this year.